Vibcare Pharma, a leading PCD pharma company operating in India and a provider of PCD pharma franchise, is offering cost-effective generic drugs in domestic, as well as international markets. Delhi, India, September 18, 2018 --(PR.com)-- Vibcare Pharma is a PCD pharma firm that is committed to increasing access to high-quality healthcare by producing and providing generic drugs, as well as by creating PCD pharma opportunities in India through offering pharma franchise. The PCD pharma franchise provider has been developing generic drugs to supply to Indian, African, CIS and South Asian markets. Vibcare Pharma serves as the pharmaceutical industry’s preferred strategic partner and provides fully integrated contract manufacturing and development solutions to its customers, from early development to high-volume commercial manufacturing and packaging. Vibcare Pharma offers a complete range of medicinal tablets, from anti-allergic, anti-cold and anti-inflammatory drugs to anti-ulcer, antibacterial, antibiotic, antihistamine and antispasmodic drugs. The PCD pharma franchise provider also supplies arthritic, cardiovascular, osteoarthritis and pain relief drugs in tablet form. Additionally, customers can get vitamin capsules, multivitamin pills, and omega 3 capsules. At Vibcare Pharma, there is an active and responsive support team to serve its customers. All the orders follow the same-day dispatch policy. Vibcare Pharma also has a powerful network of professional medical representatives and marketers. 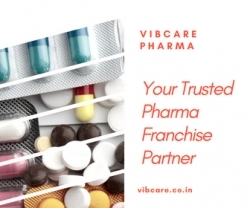 Vibcare Pharma is a pharma PCD Company that offers franchise services for vacant territories in India. The partners in this franchise program receive interesting promotional benefits and support for higher profit generation. The PCD pharma franchise provider also provides pharmaceutical products for general and specific treatments. Those trying to find best pharma PCD companies may rely on Vibcare Pharma, which not only manufactures its products to highest quality standards but also ensures to comply with the health and environmental safety requirements. Vibcare Pharma is a provider of PCD pharma franchise opportunities in India, as well as a manufacturer of high-quality generic medical drugs. The pharma PCD Company supplies a wide variety of medicinal drugs for the treatment of varied medical conditions. These range from the cardio-diabetic drugs and central nervous system drugs to lotions, tablets and capsules for skin problems. Vibcare Pharma manufactures medicinal drugs in several therapeutic segments, such as anti-thyroid, analgesics, respiratory, musculoskeletal, anti-depressants, and anti-ulcer and anti-secretory.